We seem to be reading and writing a lot about superbugs—antibiotic resistant bacteria that are responsible for at least 2 million infections (including healthcare-associated infections acquired while receiving medical treatment in a hospital) and 23,000 deaths each year in the US.1 But the recent discovery of the “superbug enzyme” NDM2 in bathing seawaters in Ireland impacted by untreated sewage/wastewater3brings this global public health issue even closer to home. After all, unless you work in the healthcare field, most of us avoid hospitals but go out of our way to spend a day at the beach! Superbugs and related cell products like the NDM enzyme have also been linked to untreated or inadequately treated wastewater in other countries such as India, where “unprecedented antimicrobial drug contamination” in waters near a major drug production hub are thought to be fueling the creation of new superbugs. Ireland and other developed nations still regularly discharge untreated wastewater to coastal and inland waterbodies. The Clean Water Act (CWA) establishes the regulatory structure for regulating point sources of pollutants, including treated wastewater/sewage, into US waters. Under the CWA, the US Environmental Protection Agency (EPA) has established recreational water quality criteria and supports local and state monitoring for indicators of waterborne pathogens and other efforts to keep swimmers safe. Pollution in the water or in the sand can also come from nonpoint sources like other bathers, stormwater and other surface runoff, or trash and animal wastes at the beach.4 Many of the cleanest beaches in the world are right here in the US. Not surprisingly, researchers have found particularly high levels of antibiotic resistant bacteria in hospital sewage.5 On average, as much as one-third of hospital patients take antibiotics during their stay. A recent WQ&HC article reported that superbugs, once washed down the drains of hospital sinks and into hospital wastewater, can colonize up the drainpipe and sink strainer area, potentially spreading infection to vulnerable patients! For perspective, according to the Global Water Pathogen Project (GWPP) established in 2016, almost 85% of the world’s wastewater is discharged with inadequate or no treatment, and which presents an ongoing major risk to public health and the environment. Effective water and wastewater management must address public health risk associated with waterborne pathogens—including well documented tragedies like diarrheal illness and death in developing nations and the growing, uncertain risks posed by superbugs. Effective wastewater treatment can help curb the threat of superbugs and rising antibiotic resistance. But while antibiotic resistant bacteria are greatly reduced by treatment, some can survive and are discharged to receiving waters, and some of those are at or near public beaches. 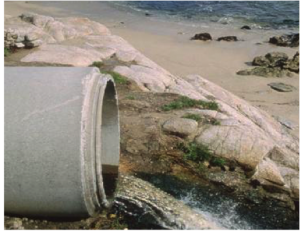 The detection of superbugs at the beach should also help place attention on the global need for wastewater treatment infrastructure—including the US. This should be a priority moving forward with new national initiatives. Using antibiotics properly and exactly as prescribed. Ralph Morris, MD, MPH, is a Physician and Preventive Medicine and Public Health official living in Bemidji, MN.Joan B. Rose, PhD, is the Homer Nowlin Chair in Water Research at Michigan State University, the editor of the GWPP, and a member of the Water Quality and Health Council. Joan B. Rose, PhD, is the Homer Nowlin Chair in Water Research at Michigan State University, the editor of the GWPP, and a member of the Water Quality and Health Council. 1 Antibiotic / Antimicrobial Resistance. https://www.cdc.gov/drugresistance/. 2 New Delhi metallo-beta-lactamase, which makes bacteria highly resistant to some of the last-line of antibiotics available to hospitals. 3 Domestic households, industrial, and agricultural practices produce wastewater, which can pollute lakes, streams, oceans, and groundwater; sewage is the term used for wastewater that typically contains feces, urine, and other household wastes. 5 Ireland Environmental Protection Agency. 2015. Hospital Effluent: Impact on the Microbial Environment and Risk to Human Health. Report No. 162. http://www.epa.ie/pubs/reports/research/health/EPA%20162%20final%20web.pdf.